PLEASE SHARE with those you know who are teachers, principals, school administrators, PTO members, parents & pretty much EVERYBODY who was born. You’d be doing my family and me a HUGE service as I launch this business! INTRODUCING NEWTON THE DRAGON, HOUSTON’S SMARTEST DRAGON (Houston’s only dragon too, but please don’t tell him that), a clumsy, zany book worm, who magically inspires Houston area youth to a brighter future through imagination and education. Newton mystically conjures up and awakens both creativity & a love for facts and figures. He is the perfect left brain right brain one two punch! 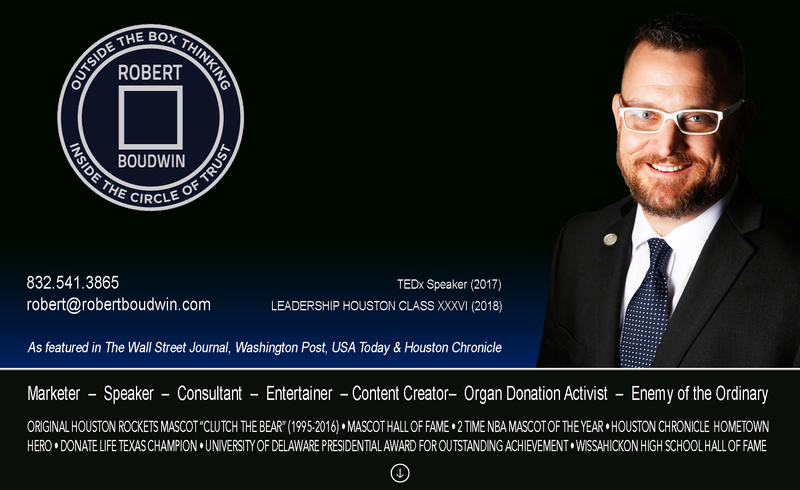 26 year veteran mascot performer Robert Boudwin (me) has created & is solely portraying this character after 21 years of performing in front of 1.2 million Houston students spanning his career as Houston Rocket’s mascot, Clutch the Bear, a character he also created in 1995. Brand new show with all new surprises, re-writing the rules of mascoting, but with the same unique brand of EDUTAINMENT you know and love! PASSION FOR HOUSTON’S FUTURE THE BEST WAY POSSIBLE, OUR KIDS! -One Part Tony Robbins, One part Muppets, One part Charlie Chaplin & 100 % AWESOME! Next Next post: KERMIT INTRODUCING NEWTON!! !